Are you very conscious of your skin that you avoid looking at mirrors, feeling unhappy whenever you do? Are you so fixated on your acne that you no longer see your other physical attributes? Are you painfully uncomfortable in social situations because of your skin? For better or worse, society places a premium on healthy and beautiful skin. As the body’s largest organ, our skin has significant symbolic value. It’s the canvas through which we express our identity, and when it appears damaged, it also negatively affects our ability to express ourselves and be confident. Unfortunately, acne and other skin issues don’t automatically disappear when you turn 21. Although almost every person goes through a phase of skin challenges, especially during their teenage years, acne breakouts can still happen well into your adulthood. Eczema, rosacea, allergy rashes, boils, warts, and stretch marks are just a few of the many skin issues that can affect people regardless of age. In any case, the impact of these skin challenges can affect your quality of life and body image in many ways. You may have heard that stress is one of the primary causes of acne breakouts in adults. This suggests that much of what causes acne and other skin problems begins in the mind. In turn, this opens up the potential for hypnosis to be a viable therapy for improving the appearance of your skin. 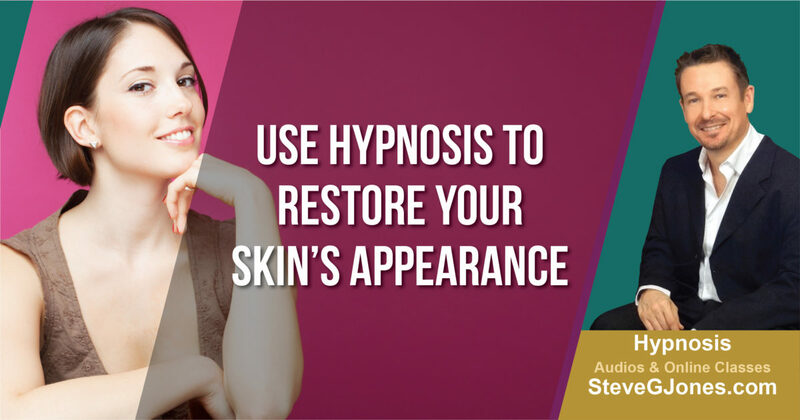 But how exactly does hypnosis improve your skin’s appearance? By putting you in a hypnotized state, your mind triggers a relaxation response that supports normal circulation and releases hormones. In turn, these hormones regulate other bodily functions not under your conscious control, which include allergic and dermatologic reactions, and even pain control and healing. If anything, this shows just how much influence the mind can have over the body’s physiological processes. Hypnosis can be especially helpful in relieving skin diseases with a psychosomatic aspect, such as acne, psoriasis, eczema, and allergy rashes. Moreover, stress leads to the secretion of stress hormones like cortisol, adrenaline, and DHEA, all of which can cause changes in the skin. For example, cortisol stimulates the production of sebum, too much of which results in acne breakouts. By teaching you relaxation techniques, hypnosis will help you develop your self-hypnosis abilities, allowing you to relax at will during stressful situations. Hypnotherapy trains your mind to think positively, using the power of suggestion to know how to handle stress effectively. The benefits of hypnosis go beyond restoring your skin’s beautiful appearance. With the right approach, your hypnotherapist can also restore your radiant health.